I rarely write about CDs in this space, but this recording on Centaur, which will be available this November 13th is really something special and worthy of your attention. I got an advance copy from Mr. Staryk, and I resisted the temptation to listen to it until the month of November was in sight. Now I just have to write about it. The Concerto had a slight resurgence in the last decade, and there have been some very good recordings of it, but this concert performance is really remarkable. The recorded sound of the orchestra is not pristine (it was probably recorded using a microphone placed in the audience), but it is rich, commanding, and beautifully phrased. 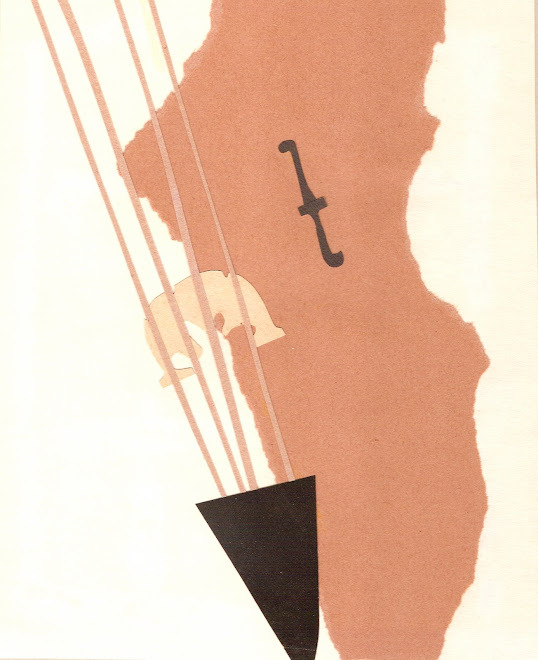 Staryk plays the solo part on the Barrere Strad, which has a fantastically complex sound. His eloquent elocution in the opening declamatory passages continues with absolute focused attention throughout the piece. Because of Staryk's commanding musical "vision," there is no way to listen without becoming completely involved in the music making. Staryk has such integrity as a violinist that every single one of the difficulty arranged notes sounds clear and clean (even through some of the recorded fuzz, and the occasional bump--like the big one at around 8:30 of the first movement). But what is most impressive to me is the way they operate as fine filagree in the musical texture rather than as pure foreground. 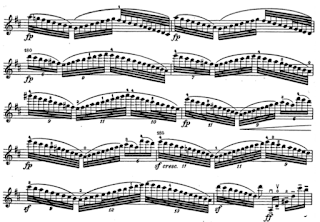 I have heard recordings of the piece where the passage work in the last movement feels like pure torture. Here it feels like pure pleasure, albeit the kind of pleasure you get from watching high-wire artists perform death-defying acrobatics. Then we get the Walton Concerto. This recording comes from a 1981 radio broadcast, and the recorded sound is better than the recorded sound in the Schumann Concerto. It is charming and brilliant, and you really get to hear all the colors Staryk gets from the Barerre Strad and the way the orchestration reflects those colors. I actually prefer this recording (with Mario Bernardi leading the National Arts Centre Orchestra of Ottawa) to Menuhin's recording with the composer conducting, but I tend to prefer Staryk's playing to Menuhin's playing in general. Staryk uses the Muntz Strad for his performance of the Mendelssohn Concerto with the University of Victoria Orchestra conducted by George Corwin. The balance between the solo violin and the orchestra is often a problem in performances of the Mendelssohn Concerto, and one would imagine that it would be a problem during this outdoor public performance in 1973, but the commanding sound of the Muntz Strad can be heard clearly even in pianissimo passages, and even when the occasional breeze causes the sound to waft away from the microphone. I love the brisk tempos, particularly the tempo of the slow movement (which is not slow). You'll have to wait for a few weeks before this recording becomes available, so in the meantime, particularly if you are unfamiliar with Staryk's playing and career, you might like to read this interview I did with him in 2009. And I'm sure you would certainly enjoying hearing the recordings on this YouTube channel devoted to films of Staryk playing recitals, concertos, and even donning a red wig and playing the part of Vivaldi in a film. Two film clips from 1953: Yves Nat demonstrates how to play Chopin to a class of students (notice the subtle way everyone begins to move once he starts to play), and Alfred Cortot gives us his "inner text" while he plays Schumann's "The Poet Speaks." What an honor it is to hear this beautifully played violin-only adaptation of my string orchestra arrangement of the Pachelbel Canon. The performance was part of The Prague Music School's 55th anniversary concert, which took place on October 18th in the Martinů Hall of the Lichtenstein Palace. The entrance of the youngest performers at the end is just priceless. I just read about a school in Winton Woods, Ohio, where the principal, Jeremy Day, who has recently started playing the viola, is a member of the fifth grade orchestra. I don't really buy this claim that Plato's works were arranged to correspond with the 12 notes of a musical scale, but I do like the idea of "not revealing doctrines that would threaten the gods of Olympus." This is something worth reading, particularly for musicians who would, like me, have a bone to pick with Jay Kennedy's musical claims. Positive concepts are lodged at the harmonious third, fourth, sixth, eight and ninth "notes", which were considered to be most harmonious with the 12th; while negative concepts are found at the more dissonant fifth, seventh, 10th and 11th. Given a 12-note chromatic scale, which was more than likely NOT generally used for the music of Plato's time, the third degree of the scale would be a whole step from the root, the fourth degree, would be a minor third away from the root, the sixth degree would be a perfect fourth from the root, the eighth degree would be a perfect fifth, and so on. It doesn't make any musical sense to me. If the degrees of the 12-note chromatic scale have particular qualities when they sound by themselves, then Plato would have to have had absolute pitch mixed with a kind of synesthesia. What respectable synesthete would divide notes simply between pleasant and dissonant. If that were true Plato would probably have written a lot more specifically about music. I believe that when he discussed modes he was commenting on the linear harmonic nature of a set of pitches going from "tonic" to "tonic" on instruments that did not have the ability to alter themselves chromatically (the lyre vs. the pedal harp, for example). I have been jumping back and forth between practicing string, wind, and keyboard instruments a lot lately, and have consequently been thinking about music, movement, and vision. String playing requires a lot of functional body movement, but, when playing the flute or the recorder, functional body movement is restricted to the breathing mechanism in the horizontal and vertical center of the body, the mouth cavity (also central), and the fingers. In the case of the recorder (or I guess with any wind or brass instrument) the hands, arms, and fingers oppose one another in a relatively still position at the center of the body. 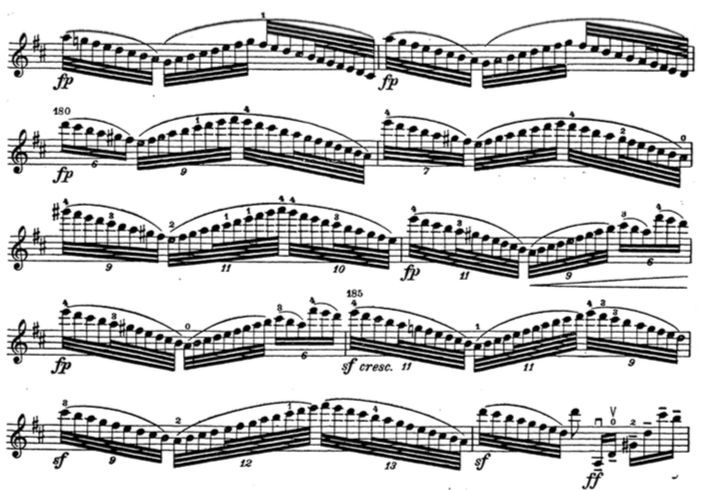 Wind players have the luxury of reading music head-on, so the music is always in the center of a wind player's physical field of vision. The flute is different from other wind instruments because the hands and arms are off to one side, though their function is pretty much the same. The mind's eye of a flutist has to be taught to visualize to the right, because that's where the fingers of both hands contact the keys. The hands and fingers are "over there," and they are impossible to actually see them when you are playing. All wind players must use their inner vision to pay attention to the inside of their mouths and the interior components of their breathing mechanisms. Nobody can really see that stuff without fancy imaging equipment. Both hands function the same way when a musician plays a wind instrument. The fingers of both hands work like levers, and ideally make the same motions, rising to and dropping from the same height, and landing in various combinations at the same time. Sometimes the little fingers and thumbs work actual levers, but that doesn't change the basic function of the fingers. The hands stay still, and they make sure the fingers function efficiently. A string player's fingers and hands do different things while being totally interdependent. The fingers of the left hand work like levers, and the left thumb works like a flexible fulcrum. The left hand fingers, powered by the arms, generate some elements of expression, and that expression is generated by constant efficient motion. The right hand fingers are both firm and flexible, and the thumb acts like a stable fulcrum, but the joint still bends when it needs to bend. The fingers sometimes pull and push the bow, and are sometimes pushed and pulled by the arm. They do millions of unseen and impossible-to-articulate unconscious things (not unlike the ideomotor phenomenon) that unlocks the subconscious mind. Unlike wind playing, there is no actual physical contact between the components that set the musical vibrations into motion. String players have to feel the music through sticks, hair, and wire (or gut). The music we make exists outside of the body, yet we cradle the instrument in the most intimate part of our neck (or lap) and use the bow to make the instrument feel like it vibrates the way a voice vibrates. We sometimes have the mental illusion that we are singing when we are playing. How the left hand looks has a huge amount to do with playing efficiently, and how the right hand steers the bow in order to keep parallel to the bridge and make efficient string crossings has everything to do with the sound. Violinists and violists have to constantly visualize left, right, and center, paying constant attention to all parts of that semi-circle we occupy. We have to use our inner eyes the way we use our peripheral vision while driving (but, thank goodness, we don't need to know what's happening directly behind us). My flute-mind "training" has taught me to visualize right when I am looking at music, so I can easily look at music and "see" my bow hand. But there is a whole world of "left" that violinists and violist also have to keep in the mind's eye. The mind's eye has to be taught to visualize a full 180 degrees (and even more, considering the fact that the tip of the bow extends another 20 degrees when playing up-bow on one of the lower strings) in addition to looking at the music. The violinist's or violist's mind's eye has to imagine a wider span than a pianist's mind's eye. Visualizing the whole half circle (and more) is always a challenge for me. I understand the challenge more acutely when I spend time practicing the recorder, which is like a vacation from peripheral visualization. Even practicing the piano involves less than 180 degrees of vision (even at the extremes of the keyboard, I can see both hands). Practicing with a mirror (or two) is really useful, but once you take the mirror away the mind's eye is on its own. I always enjoy sitting to the right when I share a music stand because my real vision is "aiming" to the left, and my left hand can be "visually louder" (by physical default) than my right hand. The conductor is also easily in view at the center. This orchestral season I will be sitting on the left side of the stand, so I will have to work harder at left-side awareness because I will be looking at the music towards the right. I'm looking forward (right and left) to the challenge. I really enjoyed reading the transcript of Frank Oteri's July 31st conversation with André Previn (which includes Molly Sheridan's film--I'm not sure who did what). I also enjoyed reading No Minor Chords, Previn's 1991 memoir about his days in Hollywood (that you can buy used for 1 cent on Amazon).